If you have positive accounts, you will have a better credit score. If your accounts are lacking, you will have a poor credit score. So, having (or adding) favorable accounts to your credit report results in an increased credit score. Many of us don’t have years to wait for a better credit score, but we feel there isn’t much we can do to improve them quickly. Well, one thing you can do is add a tradeline. You, the “receiver,” inherit the payment history and characteristics associated with that positive account. If that account is in good standing, your credit score will reflect that information and your credit score will increase. Do you need more money for your business? Get $10,000 to $50,000.fast without Docs. we have program for you. Let Me Guess, You're Wondering If Your Tradeline Has Linked To Your Credit Report Yet? Since 2006, we’ve pride ourselves in cutting edge techniques to effectively maximize YOUR results. We have taken it upon ourselves to hold up to our reputation as being the leader in credit enhancement in every facet of the process. From our outstanding customer service to our amazing ethical standards we are here to serve your most challenging credit needs. Our uniquely effective tradelines program utilizes a powerful set of tools designed to deliver the best possible results for our customers. 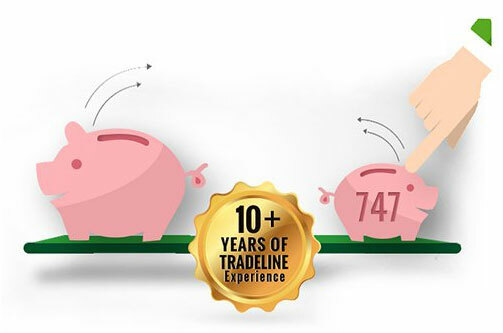 With 520 tradelines, we are sure that you’ll find one that will work for you.